me) my whole system of beliefs, higher powers, and humanity came to the forefront of my life. I can now appreciate what this sweet angel represents. I will honor and love her because she is me and I am her. Sure, my robes are tattered and my halo is askew, but I think I can pull it off. I may be tarnished, but the real deal is in here somewhere. This blessed angel , cradling a puppy, speaks volumes to me. 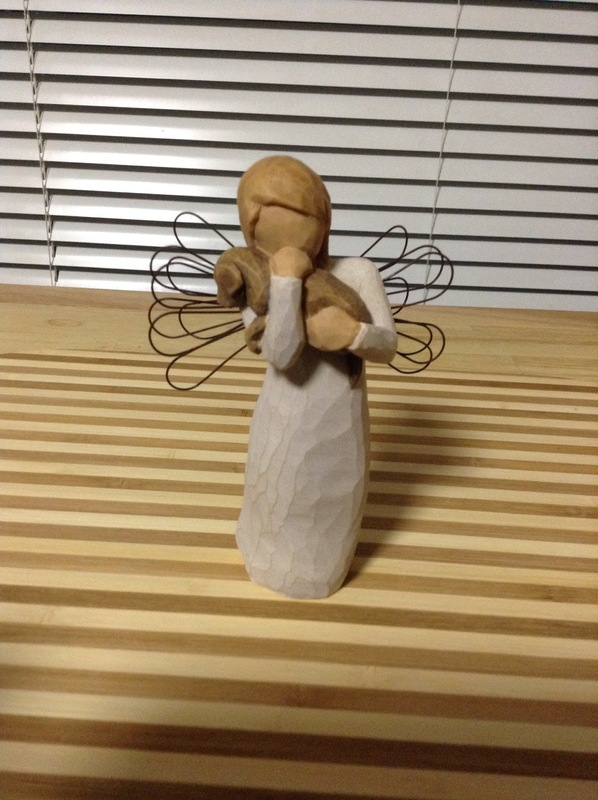 Ironically, the angel has no mouth, but I can hear her. She’s telling me to be kind. To be grateful for what I have. To not be judgmental. To hold what I love in my arms, close to my heart. Me, Lisa and Billy laughed, we ate, we talked and talked. Tucker sat at the table with us. It’s all falling into place. I visualized happiness, music, love, good friends and good food here at Happy Landings. I think I’m getting it! Peace to all the angels out there. You know who you are.